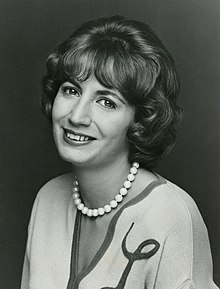 Carole Penny Marshall (October 15, 1943 – December 17, 2018) was an American actress, producer and director. She starred as Laverne in the sitcom Laverne & Shirley from 1976 to 1983. Marshall directed many movies, including Awakenings, A League of Their Own, and Big. From 1971 to 1981, she was married to actor and director Rob Reiner. Her brother was director Garry Marshall. She was born in The Bronx, New York City. Marshall died on December 17, 2018 in Los Angeles, California from heart failure complicated from diabetes and heart disease, aged 75. ↑ Dennis McClellan (December 18, 2018). "Penny Marshall, who played feisty Laverne in 'Laverne & Shirley' before directing movies, dies at 75". Los Angeles Times. Retrieved December 18, 2018. This page was last changed on 5 January 2019, at 19:36.